Are you a former member of FIERCE? A graduate of the Education for Liberation Project who has gone on to work at other social justice organizations? A founding members now living in another city? If so, then FIERCE invites you to be join our Alumni Network! The network is our way of keeping you up-to-date about FIERCE and find ways for you to stay involved with FIERCE even after you age out! By joining the network you’ll be plugged into FIERCE once again and presented with opportunities to re-engage with our work. 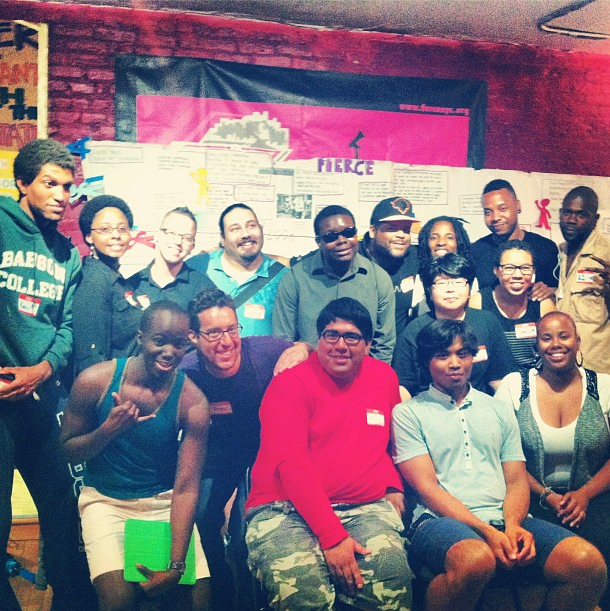 The network is a great way for you to support the work of the next generation of LGBTQ youth of color organizers! The survey is super important because it allows us to assess the impact that FIERCE has had on young people throughout the years. It's a way of affirming and re-evaluating the work that we’ve been doing and will do. We want to know what our alumni are up to and hear your feedback. Click on Survey to catch us up on what you've been up to! Once there you can opt to join the network. It's fun. Ya'll know we like to stay fabulous in all we do! Get reconnected to FIERCE's organizing work and create exciting ways to stay involved. Help build a strong alumni network that supports FIERCE to continue building the leadership and power of LGBTQ youth of color! If you have any questions about the FIERCE alumni survey, or any other questions about getting involved, please contact fred [at] fiercenyc [dot] org (Fred Ginyard).